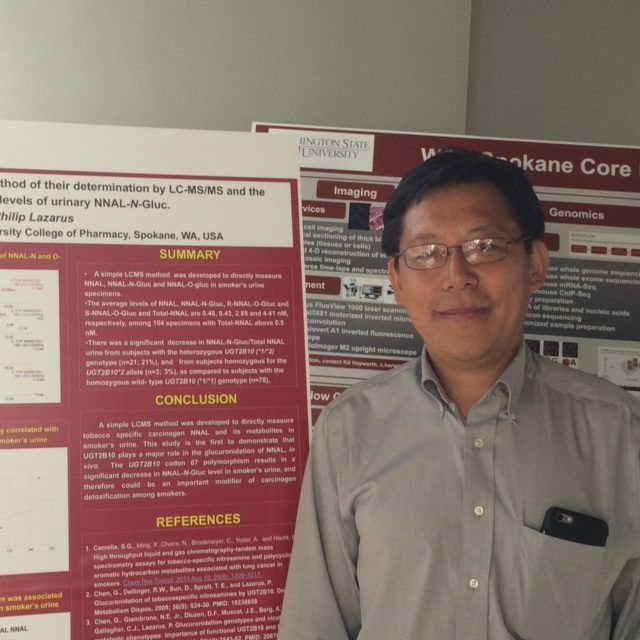 Over the last few years, the HSSA has committed more than $1.54 million to assist WSU Spokane to build critical core laboratories for use by WSU researchers and other university and private researchers in the Spokane and Eastern Washington region. 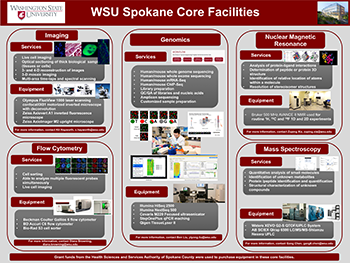 These state-of-art core labs attract the best scientists and researchers to the Spokane campus, as well as support their ongoing research in the health sciences. Download the Core Facilities poster. he Genomics Core Facility is led by a faculty-level director and provides laboratory support, technical advice, assistance with experimental design, and data analysis for investigators using high-throughput genomic sequencing, genotyping, gene expression and epigenetic analysis in their research programs. The facility currently provides support for processing RNA an DNA, performing targeted RNA-Seq, BS DNA methylation, ChiP-Seq, and qRT-PCR, as well as analysis of targeted genomic regions, small genomes (viral and mt DNA), and whole exome and genome sequencing studies. In addition, staff work with investigators to develop new methodologies and incorporate emerging technologies into their research. Computational support for hardware, data analysis and storage of high-throughput sequence data is also available. Equipment located in the Genomics Core Facility includes: Illumina HiSeq 2500 with C-bot and Illumina NextSeq 500 for high-throughput DNA sequencing; Beckman Biomek FXP automated workstation for high-throughput sample preparation; Thermo 2000 Nanodrop for nucleic acid quantitation; QuantStudio 7K Flex real-time PCR system for sample amplificaion; Spectromax M2 (Molecular Devices) with UV/VIS/Fluor 6 X 1096 well format for large-scale nucleic acid quantitation; Bioanalyzer (Agilent 2100) for sizing, quantitation, and quality control of RNA and DNA; Qiagen TissueLyzer II for rapid homogenization of tissue, and Covaris M220 for DNA/RNA shearing. The Microscopy Core Facility is led by a faculty-level director and provides researchers with access to high-end confocal microscopy in addition to more conventional brightfield and fluorescence microscopy. The Microscopy Core Facility provides assistance with all imaging procedures as needed, and aids in customizing staining protocols to optimize data quality from tissue and culture-based research studies. Services include optical sectioning of thick biological samples, live-cell imaging, 3- and 4-D reconstruction of images, 3-D mosaic imaging, and multi-area time laps, spectral scanning, FRET/FLIT/FRAP imaging. Instrumetation includes an Olympus FluoView 1000 laser scanning confocal motorized inverted microscope with deconvolution, a Zeiss Axiovert A1 inverted fluorescence microscope, and a Zeiss Axioimager M2 upright microscope. The Flow Cytometry Core Facility is led by a faculty-level director and provides support for cell sorting and live cell imaging. Capabilities include simultaneous multicolor analysis of cell phenotypes, single-cell disposition sorting, quantitative measurement of fluorescent reports to assess distribution of specific molecules withing cell populations, and fluorescent protein expression. Core Facility staff provide training, consultation, technical assistance, and troubleshooting. Instrumentation includes a Bio-Rad S3 cell sorter, a BD Accuri C6 flow cytometer, and a Beckman Coulter Gallios 6 flow cytometer. The Mass Spectrometry Core Facility is led by a faculty-level director and provides collaboration, consultation, and technical support for the analysis and quantification of small moleculars such as drugs and drug metabolites in biological samples. Other services include the structural identification of unknown metabolites, protein/peptide identification and quantification, and proteome profiling. Instruments include the Waters XEVO G2-S QTOF/UPLC system and AB Sciex QTrap 6500 LC/MS/MS-Shimazu Nexera UFLC system. The Nuclear Magnetic Resonance Core Facility is led by a faculty-level director and provides structural determinations of small molecular compounds, including peptides, nucleosides, drug metabolites, and potential new therapeutic targets. Applications include protein-ligand interactions, peptide 3-D structure, resolution of stereoisomer structures, and determination of the relative locations of atoms. The Core Facility also provides training, consultation, collaborative research opportunities for analytical applications. A Bruker 500 MHz AVANCE II NMR is used for routine 1H, 13C, and 18F 1-D and 2-D experiments.